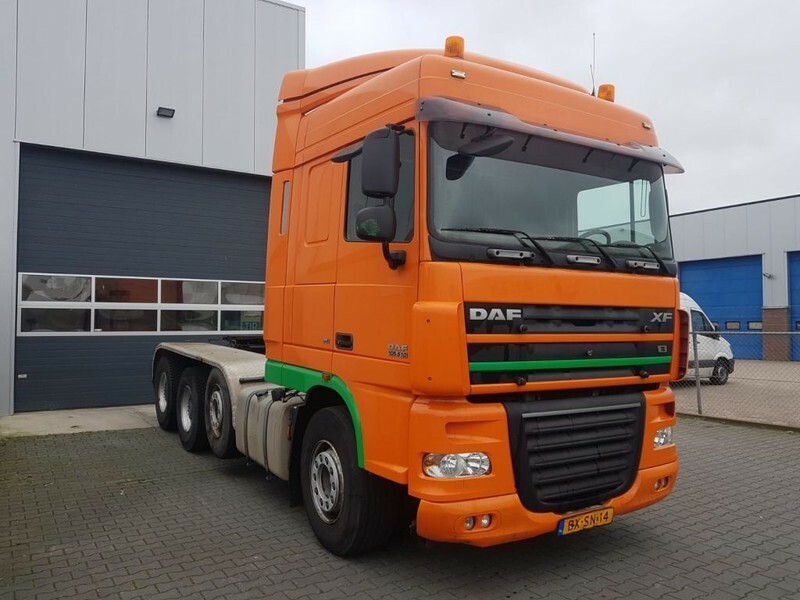 Buy DAF 105 XF 510 SC 8X4 Triple tractor unit by De Bruin Trading B.V. The detailed specification of DAF XF tractor unit is provided below. Engine/driveline: Euro 5, displacement: 12902 cc, engine cylinders: 6, 510 hp, gearbox: manual, transmission: Schaltgetriebe, retarder/intarder. Wheel formula and suspension type: suspension: air, 8x4, number of axles: 4, lift axle, steering axles, wheel base: 5500 mm, ABS, chassis side skirts. Cab comforts include cab type: sleeper cab, cab model: Space Cab, roof spoiler, sunvisor, power windows, electric mirrors, central lock, air conditioner, parking heater, cruise control, radio, CD, fridge. The payload is 23925 kg.